As part of the SuPER-W program, Outreach and Dissemination Tool (ODT) projects are being developed (https://www.superw.ugent.be/outreach). One of the projects focuses on elaborating a tool and course on environmental technologies connected to wastewater treatment and resource recovery. This tool will be implemented in Peru in collaboration with Engineers without Borders – Catalunya (ESF - https://esf-cat.org/) and the “Unidad de Gestión Educativa Local” (UGEL - http://www.ugeljaen.edu.pe/). ESF has several ongoing projects in Peru led by Laura Lucio. Our SuPER-W outreach team will be working together closely with her on-site and were able to interview her in order to find out more about their activities. In addition, the project is partly funded by the Global Minds Fund (Federal Belgian Government through Ghent University). Can you please tell us about how you came to Peru and your work for ESF Catalunya there? I came to Peru in 2008, working for a British NGO on territorial planning and environmental issues. This gave me the opportunity to get in touch with NGOs that are active in the region like GRUFIDES (http://www.grufides.org/) and ESF Catalunya. In 2011 ESF posted a vacancy I applied for. Now I am the representative of ESF Catalunya in Peru, coordinating all projects that are being developed here, hence I develop, plan and execute activities and projects on-site. We are still working closely with GRUFIDES but also with universities, municipalities etc. Our main fields of activity are human rights and environmental issues (often in connection with mining and social conflicts), renewable energies, appropriate technologies and productive processes (e.g. solar dryers and wastewater treatment for coffee, cacao production etc.). 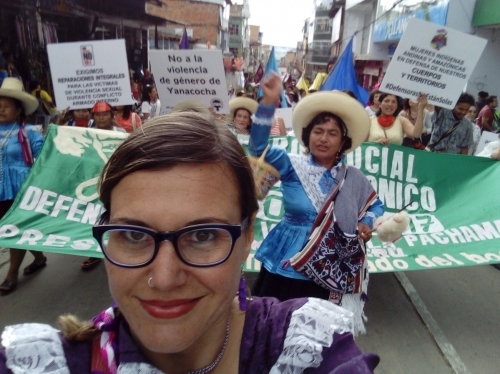 Often these projects are connected with the empowerment of women (gender issues, economic independence of women) and human rights, targeting the extractive industry areas (mostly mining), in order to reduce harm caused by extractivism. Cajamarca is such a region, where mining already started in the colonial era, and it continues today with big international mining companies that have been operating in the area for more than two decades. Besides the human rights that are negatively affected within these areas, environmental pollution is also a big concern. These result in many social conflicts. As more mining activities are planned, we are expecting even more conflicts in the future. In your opinion, what are the major challenges that Peru is facing? In my opinion, the main problem is the model of neoliberal extractivism. One of the main economic sectors in Peru is extraction and export of minerals and oil which doesn´t create benefits for the population but has adverse social and environmental impacts, leading to many social conflicts. At the same time, there is a big problem with governance, partly stemming from Fujimorism (Regime led by Alberto Fujimori in the 90ies, who has been pardoned last year and is out of jail). However, his party continues to exist and have the absolute majority in the congress at the moment, issuing laws along the ideology of neoliberalist capitalism, also curtailing civil rights and generally leading to huge problems in terms of governance. This is the reason why the activities of ESF here have a strong focus on human rights at this moment. The issue is also partly connected to drug trafficking, illegal mining and overall a very complicated problem. On top of it all Peru is one of the countries that is most vulnerable to climate change; e.g. Peru has the highest concentration of glaciers in the subtropical climate zone and is therefore very affected. How is the water supply and sanitation situation in Peru? Due to the geography of Peru only 1% of fresh water flows towards the coastal region and the rest, nearly 99%, flows to the Amazon. The coast of Peru is a desert, however, 70% of the population is concentrated there, causing a big imbalance with very few water reserves for the majority of the population. Therefore, already before the effects of climate change appeared, the region was vulnerable in terms of water supply. This year El Niño caused many problems with flooding in which many people lost everything, causing a great chaos with trash and debris everywhere. In addition, there is many asparagus being farmed in the desert using a lot of the little water that is available. The majority is exported, e.g. all the asparagus in Spain comes from Peru. These are neoliberal, capitalist and unsustainable economic models rooted in the neoliberal government from the 1990s. Concerning sanitation, in the region of Cajamarca 0% of the wastewater is being treated! Everything is discharged to the rivers. Just yesterday, we had a meeting with some municipalities and we were talking about this topic. The city of Cajamarca has 250,000 inhabitants and none of the wastewater is treated but goes directly to the river. River water is used for agricultural areas, e.g. corn, lettuce, big beautiful lettuce (laughs). In Jaén, coffee production is a big issue for waterways, especially in the season when the beans are washed and fermented as the wastewater flows directly into the river. This water is very acidic causing acidification of the natural water bodies. They call it the “aguas mieles”. Since the whole area is producing coffee, the amount of wastewater is huge. And in the south, there is the mining industry. The main river and water source of Cajamarca, the Rio Grande, receives wastewater from the mining operations with a minimal treatment. As the water treatment plant of Cajamarca was built in the 1980s (before the mining started), it is not properly equipped for the specific treatment requirements of the polluted water derived from the mining areas. The water contains a lot of lime; if you open the tap in Cajamarca, the water is white. A lot of people have problems with their kidneys, a lot of stomach related sicknesses, there are no studies but it is apparent that this is connected to the bad water quality. Our SuPER-W outreach team will go to Peru in August 2018 for around 2 months to raise environmental awareness amongst schoolchildren and communities as part of the UGEL project. Can you tell us the basics of the UGEL Jaen project and your experiences/lessons learned so far? We gained our first experience from our two ESF volunteers, Julia and Borja, who worked in the UGEL project for several weeks in 2017. One problem is that some of the schools are very far. We went to each school once a month. The UGEL team has 4-5 people and receives support from public and private entities. They are rotating through 15 schools and constantly touring the countryside. They identified more potential schools but the problem was that they were very far so they could only go 2 times to each school. The ESF volunteers helped in three schools and built two solar dehydrators for coffee and an improved kitchen. In the future, for the SuPER-W volunteers, we will select schools which are closer. What advice can you give to the students and volunteers who come to ESF Peru, in terms of living and working there? In terms of security, we have a protocol that we will explain when they arrive. There is also a preparation by ESF Catalunya in Barcelona before they come over. As for the general security issues, these have to be taken into account. People who are settled in Cajamarca have to be more attentive due to the mining issues, because people who are getting involved with these issues are sometimes threatened and chased. Jaen is more or less quiet. Of course, there are pickpockets stealing phones and so on but in a non-violent way. On the other hand, people are nice and peaceful. Jaen offers all services: there are many places for accommodating the volunteers. If you could talk to the European Parliament, what would you talk about? Please tell us in a few sentences.